Brakes may be the single most important part of your vehicle. Each time you drive, you rely on your brakes to stop safely and, in some instances, avoid collisions. Your brakes must be maintained at all times not only to keep your safety in check but to preserve the safety of everyone on the road as well. Bring issues stopping to a halt when your turn to Wayne’s Auto Repair for effective brake repair in Westerville, OH. The importance of having a properly working braking system can’t be understated. When you’re experiencing trouble braking, you pose a risk to your safety and the safety of others on the road. That’s why we consider it our duty to provide our customers with comprehensive brake service to identify, diagnose, and resolve their most troubling system issues. From your calipers and pads to its fluid levels, no element of your system is too small for us to review. No matter what your vehicle needs, you can be confident that our ASE-certified team has the tools and skills needed to return your vehicle to a safe, optimal performance. More than just a safety hazard, squeaking or squealing brakes are annoying to listen to. While some drivers choose to put up with their vehicle’s strange noises, the grating cry of worn-out brakes should never go ignored. That’s your vehicle trying to tell you that your brakes need replacing. When you turn to our skilled mechanics for a brake replacement, we’ll deliver high-quality work in a timely fashion to ensure that your vehicle is returned to a road-ready condition as quickly as possible. Let us put an end to your braking issues and get you back behind the wheel with the peace of mind you deserve. As motorists ourselves, we understand that your vehicle is an expensive investment. When it’s not performing as it should, getting from point A to point B and handling your daily obligations becomes significantly harder. Fortunately, you can always trust our adept mechanics to approach your need for brake repair and full-scale auto maintenance on an individualized basis and with your wallet in mind. We’ll never suggest repairs unless we’re sure you need them, and when we do, we won’t perform any work beyond what you expect until you’ve permitted us to do so. Rest assured that no matter what you need to get your car, truck or SUV back on the road, we’ve got what it takes to make your vehicle operate smoothly and safely again. 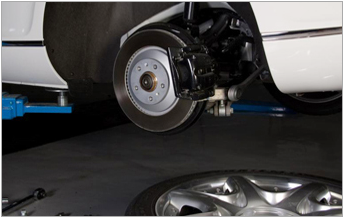 Contact our family owned auto shop for swift, effective brake repairs. We proudly serve vehicle owners from Westerville, Columbus, Worthington, Gahanna, and New Albany, Ohio, as well as the surrounding areas.